Hey there. I was just offered the opportunity to provide you guys with another great giveaway! 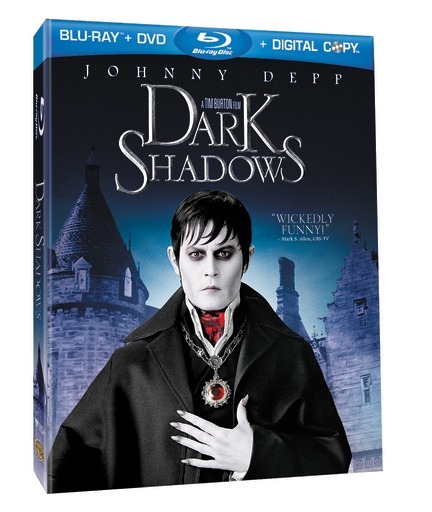 This time, from our good friends at Warner Bros. have offered to provide a Dark Shadows movie Combo Pack (Blu Ray, DVD, and UV Digital copy), starring Johnny Depp and directed by Tim Burton, to you guys, my fine readers! The only thing that I ask is for a little interactive fun. Below is the official Dark Shadows app. Click, browse and share what you find in the app. The only mandatory entry that I ask of will be to share what the Horror Scope has to say about your birthday! Here's mine! Tyranian Taurus! I like the sound of that! So what's yours? Click on the app below and find out! And don't forget to enter to win using the giveaway widget! This will be a quick draw giveaway and will be open for a little over a week. Giveaway ends on Oct. 15th and the winner will be contacted on Oct. 16th. Make sure to share the giveaway since PunchTab offers bonus entries that those who share! Good luck! Later! Hey there Roxanne. I got the same thing! certainly is your middle name! BAM! You tend to surround yourself in total isolation. Your spookiness creates havoc in your universe and it is why you have the tendency to detach yourself from close ones. Try to overcome this by sticking to being friendly to everyone you meet. Beware the Leo! you in a romantic encounter with a witch or warlock....BEWARE! Tyranian Taurus: Revenge is your middle name. You tend to hold grudges for a long period of time which is what motivates you to cast those gruesome spells on past lovers. If you can't have them, why should anybody else? Someone scream "party" ? Shake off those willies because you're in command on fright night. Take control of the evil doings and scheme up something madly frightening for you and your loved ones. We share the same Sign! "Revenge is your middle name. You tend to hold grudges for a long period of time which is what motivates you to cast those gruesome spells on past lovers. If you can't have them, why should anybody else?" Oh you and your romantic Libran ways. You always seem to find yourself in a lustful pit of passion that grasps you by it's diabolical claws. No worries though, try to find your peace within the darkness and your diabolical master plan will work itself out. Evil is in your blood and the power of true horror lies in your hands, lest beware meeting your diabolical match. Others may not be who they appear to seem, don't let these minions drive you to the brink of insanity! Howl at the moon tonight. Pernicious PiscesOn a late night adventure into a cemetery you are more willing to let a friend take the lead. Although you tend not to do scary things alone, your dark side grows ever stronger. You love a scary story but make sure you don't forget to turn the night light on before shut eye. LOL! On a late night adventure into a cemetery you are more willing to let a friend take the lead. Although you tend not to do scary things alone, your dark side grows ever stronger. You love a scary story but make sure you don't forget to turn the night light on before shut eye. Own It Now!Go HomeLabyrinthian LeoYou simply have the most unique and elaborate imagination. Vampires, werewolfs, witches, you believe in them all. You prefer to do your adventures during the day rather than lurk in the shadows. Fair warning, don’t let your imagination take you too far. Constant paranoia and feelings of being watched will keep you on your toes this season. Keep watch of the tides...Your headstrong attitude could land you in a romantic encounter with a witch or warlock....BEWARE! You have a tendency to flirt with evil but are far from truly wicked. Your innate duality allows you to adapt to any frightful situation and stay sharp on future obstacles. Proceed with caution though...don't let your confidence foil your next evil plot. Revenge is your middle name. You tend to hold grudges for a log perioid of time which is what movtivates you to cast those gruesome spells on past lovers. If you can't have them, why should anybody else? You should try to deal with any pressing issues today before you do anything else -- well, except maybe making your coffee! You just don't feel right until your plate is clear of potential crises. should dive right in and make the most of it! A serious and even intense energy surrounds you these days. You feel like the only way to let go of these overpowering emotions is to whip up some witches brew and give it to the one you have your heart set out for. So what, you use a little brew to get the love you want. It works! I am a Cancerian Moonchild. madly frightening for you and your loved ones. Sagittarius Barbarius: Someone scream "party" ? Shake off those willies because you're in command on fright night. Take control of the evil doings and scheme up something madly frightening for you and your loved ones. lovers. If you can't have them, why should anybody else? name, it certainly is your middle name! BAM! Remember to ALWAYS SMASH A SPIDER WHEN YOU SEE EM!!! I am a Labyrinthian Leo! tyranian taurus Revenge is your middle name. You tend to hold grudges for a long period of time which is what motivates you to cast those gruesome spells on past lovers. If you can't have them, why should anybody else?